Indiana School of Education’s “great eight,” pictured above, are set to receive their doctorates together. Eight African-American women, all on different paths at different times, are set to make history at the Indiana School of Education, where they are all doctoral candidates. "We understood very early on that we had a distinction, a commonality, a thread between all of us, and so we began to meet as a group," doctoral candidate Nadrea Njoku told Fox 59. 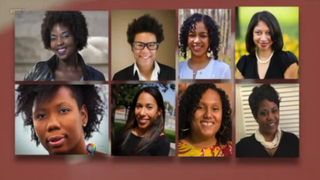 Along with Njoku, Demetrees Hutchins, Jasmine Haywood, Johari Shuck, Tiffany Kyser, Jada A. Phelps-Moultrie, Juhanna N. Rogers and Shannon McCullough—"the great eight," as they've been dubbed—are set to walk across the stage in May and defend their dissertations this summer, the news station reports. They all formed a tight bond that now has them set to receive their Ph.D.s at the same time in a field where black women are rare. Inside their sister circle, they were able to decompress from feelings that may arise with being one of the few women of color in a class. "When you're the only or one of a handful of people of color in the classroom, particularly when it comes to speaking about issues of race, you can often become the token or spokesperson," Haywood said. "We really value the fact that we need each other to deal with emotional expression," Shuck added. The women didn't think they had done anything special, since they found it natural to uplift and support one another. In fact, they were surprised at the attention their story received, but they are taking the opportunity to shine the spotlight on those who may follow the path they've blazed. "If we get more images of showing us in these positive lights," Hutchins told Fox 59, "then we can truly say this is nothing special because it happens all the time. So until we get to that point, we'll be the great eight and we'll shine that light on it." According to the news station, the group has plans to meet with school leadership on ways to make the school more inclusive, including minority-recruitment efforts and mentorship programs. Read more at Fox 59.